Citroën C5 Aircross Performance, Engine, Ride, Handling | What Car? 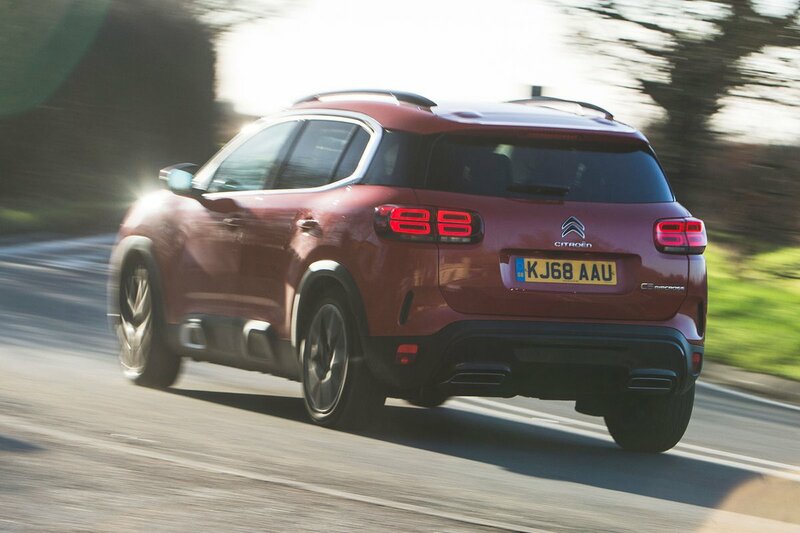 Glance at the brochure and you’ll discover the C5 Aircross offers a pair of turbocharged petrol engines and a pair of diesels. The petrols are a 128bhp 1.2 and a 178bhp 1.6, while the diesels have the same power ratings but different capacities: 128bhp from the 1.5 and 178bhp from the 2.0-litre unit. The 128bhp petrol might not seem very powerful for an SUV, but it’s actually more than capable. Indeed, the C5's lower weight makes it feel even punchier than in the Peugeot 5008. It pulls well from below 2000rpm and revs freely to its red line. Not that you'll have to thrash it around town; well-chosen gear ratios mean you won't have to swap cogs too regularly. The 178bhp 1.6 petrol is also genuinely impressive. It has more low-end grunt than the Mazda CX-5’s naturally aspirated 2.0-litre petrol, so you don’t have to rev it hard just to keep up with fast-moving traffic. It also has more zip away from traffic lights than the CX-5, feeling as swift as the most powerful petrol Skoda Kodiaq. However, while the extra poke is welcome, the 1.6 is only available with an automatic gearbox and in the top two trim levels, pushing its start price more than £5000 higher than the 1.2-litre petrol. The 1.5-litre diesel provides solid performance, although it needs to be worked hard and offers a disappointing lack of torque at low revs. The 2.0-litre diesel feels suitably grunty, though, offering strong real-world pace. Indeed, if you're planning on brimming your C5 Aircross with family and gear on a regular basis, could be a sensible choice. The lower-power petrol and diesel units come with a choice of manual and automatic gearboxes, while the pokier versions are auto only. Thankfully, changing gears with the manual isn't too much of a chore; the gearlever and clutch only require a light touch. The lever's throw is a little long for our liking, though. The autos reacts well when you use kickdown and changes promptly through its gears, although we found it to be more hesitant and haphazard in the 2.0-litre diesel – it would occasionally pick too high or too low a gear for the situation at hand. There are cars in this class that have a firmer edge, such as the Mazda CX-5, and there are those with a gentler touch, including the Peugeot 5008 and Honda CR-V. The C5 Aircross is the softest of the lot. 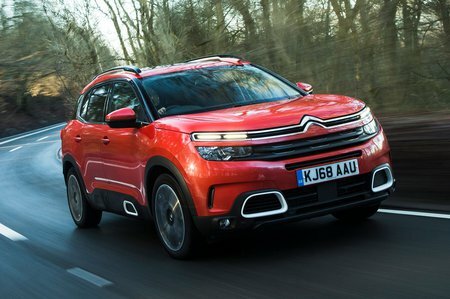 Citroen prides the C5 on its Advanced Comfort package, which includes ‘Progressive Hydraulic Cushions’ on each shock absorber to help keep suspension controlled and give the SUV a pillow-soft ride. This is a tremendous virtue if you like to be pampered, because travelling at higher speeds – say, on a motorway or an A-road – is like lying back in a comfy hammock that’s swinging gently in the breeze. That said, along a particularly undulating road, the combination of tall body and soft springs can induce the kind of side-to-side sway that might cause nausea if your kids are susceptible to travel sickness. 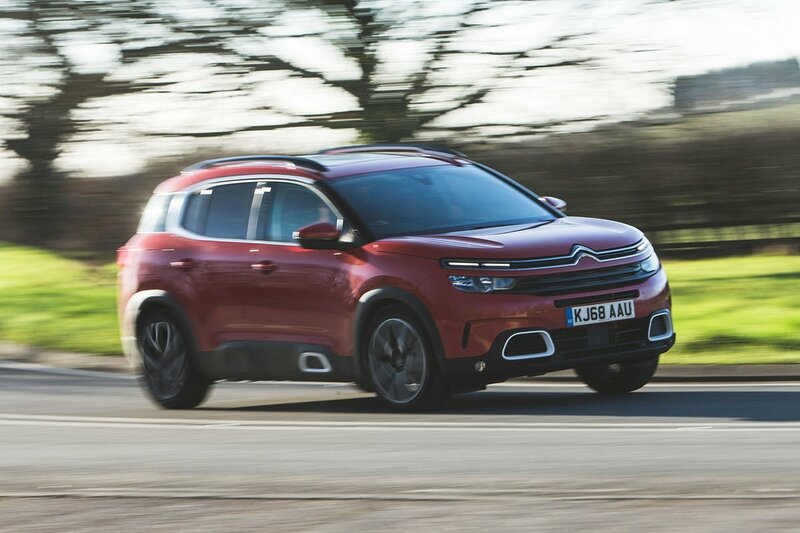 While Citroen likens this to a ‘flying carpet ride’, it often results in a more boat-on-choppy-waters feel. In which case you might appreciate the added body control you get in the 5008 and CX-5. The main area where the C5 Aircross is less proficient, though, is over really beaten-up town roads. Any indents with a sharp edge cause it to thump, although not as badly as they would in the more brittle CX-5. Reading the section above about the C5 Aircross’s sponge-like ride, you can probably guess where this is going. That’s right: if you’re the kind of driver who’s more Lewis Hamilton than James May, aka Captain Slow, you should look elsewhere. Let’s begin with the steering. It’s as light as a feather, which is great for tight turns in town, but out on the open road it barely adds any weight, so you feel precious little sense of connection to the front wheels. Then there’s the body roll, which is epic. Turn in to a bend with any gusto and the C5 Aircross leans as alarmingly as that tower in Pisa, although the grip it musters is fine. If you enjoy driving gently, none of this will be a problem, but the 5008 and CX-5 deliver a heap more driver enjoyment. The petrol engines are smooth and quiet when you’re driving in a normal manner, but get a little more raucous at high revs. That said, it's no worse than the petrol Skoda Kodiaq and far quieter than the equivalent Honda CR-V and Mazda CX-5. The 2.0-litre diesel isn't too far behind the petrol when it comes to overall refinement, being one of the quietest diesels in the class. However, we would implore you not to touch the Sport button. With that mode engaged, you receive uncalled-for speaker-generated engine noise that feels entirely inappropriate in a family SUV. All engines transmit a few vibrations through the controls at times, but these aren’t drastic. The C5 Aircross is exceptionally quiet on the motorway, though. At a steady 70mph, it stifles wind and road noise more effectively than anything else in the class, making it a supremely relaxing car in which to cover big mileages. One small misgiving concerns the automatic gearbox which, while generally smooth, will occasionally shunt if you back off the throttle abruptly, it’s as if you catch it off guard and feel it jolt when it wakes up.